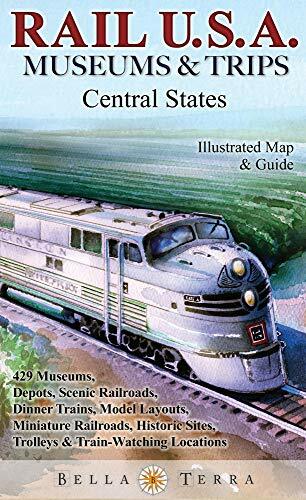 Rail USA Central States Map &amp; Guide to 425 Train Rides, Historic Depots, Railroad &amp; Trolley Museums, Model Layouts, Train Watching Hotspots, Dinner Trains &amp; More - Rail U.S.A. Museums &amp; Trips! The Ultimate Guide for Railroad Enthusiasts! Information on 400+ rail attractions from the Great Lakes to the Gulf Coast -- the most comprehensive and up-to-date listing anywhere. Rail museums, historic depots, scenic railroads, dinner trains, trolleys, model layouts, train-watching locationsand moreare located on detailed maps for easy travel planning. 16 brilliant original watercolor illustrations. Directory describes every point of interest, with street address, phone number and web site. 27" x 39," folded to 6" x 9 3/4," printed two sides.